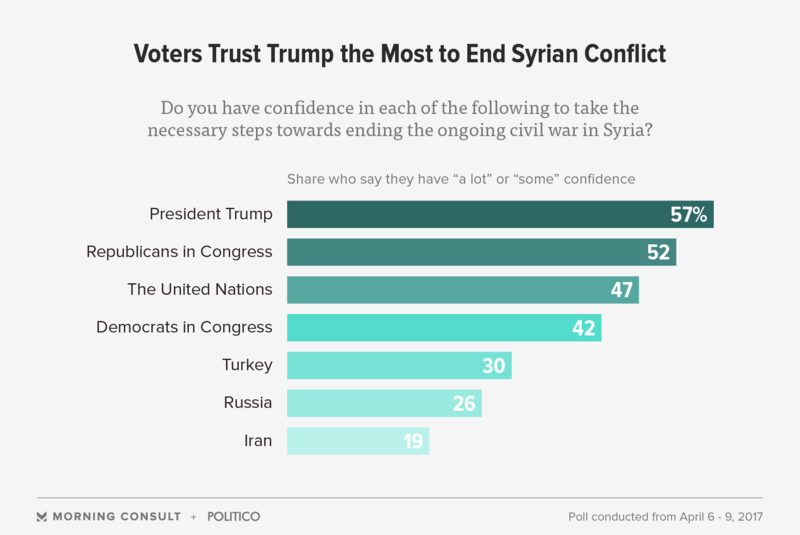 Americans trust President Donald Trump more than the international community or Republicans in Congress to take the necessary steps to end the ongoing civil war in Syria. According to a new Morning Consult/POLITICO survey, 57 percent of Americans are confident that Trump can end the conflict. The poll was conducted after Trump ordered missile strikes to destroy military assets believed to have been used by Syrian President Bashar al-Assad to deploy chemical weapons. 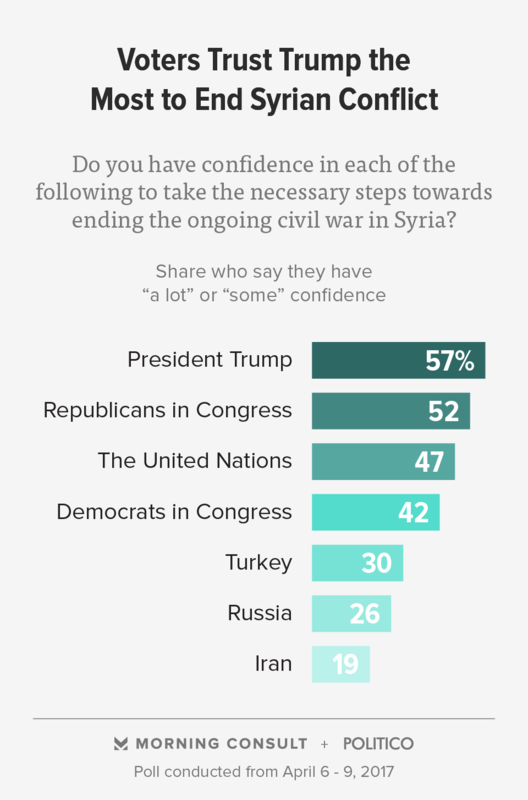 Just about half of Americans (52 percent) have confidence in Republicans in Congress to take the necessary steps to end the Syrian conflict, while 37 percent said they did not have confidence in Capitol Hill’s majority party. About a third of voters, 34 percent, said they did not have confidence in Trump’s ability. Some say Congress should consider authorizing the president to use military force against Assad, but Republican leaders have stopped short of saying such a measure would be necessary. They say the president has enough authority. Republicans are more confident in the president than they are in their representatives in Congress. More than 8 in 10 Republicans (82 percent) said they were confident that Trump could handle the Syria conflict, while 77 percent said they trusted congressional Republicans. Americans have less confidence in international actors. Only a quarter of Americans (26 percent) have confidence in Russia, which has been involved in Syria militarily since at least 2015, to take the steps necessary to end the conflict. Less than half (47 percent) think the United Nations will take the proper steps. Despite their lack of confidence in the U.N. to take the right steps, 74 percent of Americans want it to do more. More than 6 in 10 (63 percent) of Americans also think the U.S. should do more, while 18 percent think it should do less. Americans have different views on how the U.S. should conduct its foreign policy in Syria. Seven in 10 voters want more economic sanctions, while 57 percent support airstrikes in Syria and cyberattacks against Assad’s military. Nearly 6 in 10 (58 percent) said they support establishing a no-fly zone over parts of Syria, including targeted airstrikes against Syrian air defense systems. Americans are split, 44 percent to 43 percent, over whether ground troops should be used to counter terrorist forces in Syria, while 44 percent oppose using ground troops to remove Assad — a move supported by 39 percent of voters. The Trump administration has not clarified its posture on Assad’s removal. On Sunday, U.S. Ambassador to the U.N. Nikki Haley told CNN that regime change in Syria is inevitable, while Secretary of State Rex Tillerson told ABC News there was “no change” in the U.S. military posture toward the regime. Roughly a quarter (24 percent) of voters strongly oppose allowing Assad to remain in power, compared with 16 percent who strongly support keeping him in place. Regardless of how voters view Assad’s position, the airstrikes Trump ordered in retaliation to the Syrian president were supported by 66 percent of voters, while about a quarter (24 percent) opposed them. Trump’s approval and voter optimism has risen in the days following Trump’s first military action as president. Almost half (48 percent) of voters said they approved of Trump’s job performance, compared with 47 percent who disapprove, bringing him back above water for the first time since the GOP’s health care debacle last month. The number of Americans who think the country is headed in the right direction was up considerably as well: 47 percent say the country is on the right track, compared with 41 percent who said the same last week. Just 21 percent of Americans blame him for the current situation in Syria, while 39 percent blame his predecessor, Barack Obama. The poll of 1,988 registered voters was conducted April 6-9 and has a margin of error of plus or minus 2 percentage points. See more here.